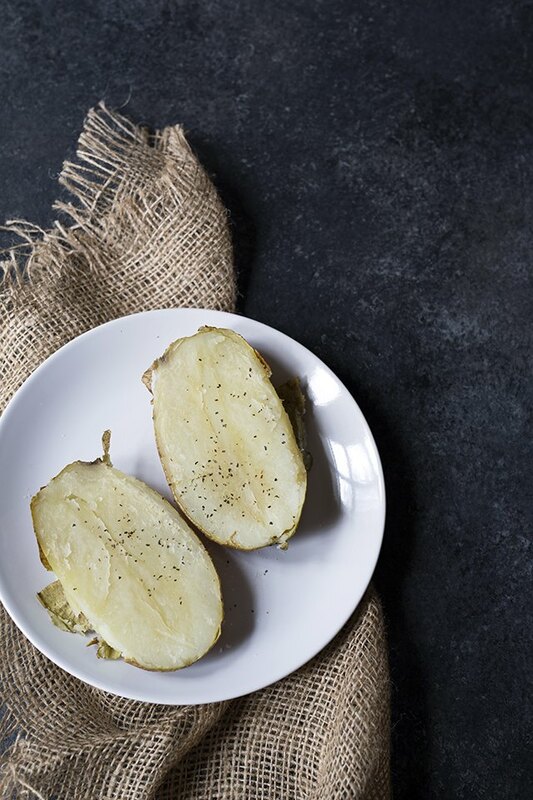 Perfect baked potatoes are crispy on the outside with properly seasoned skin, and tender on the inside. You don't need special tools or ingredients to achieve these results every time. A thin layer of extra virgin olive oil will crisp up the exterior while allowing salt and pepper to adhere to the skin. A fork can be used to create small vent holes in the skin, which allows steam to escape during baking. 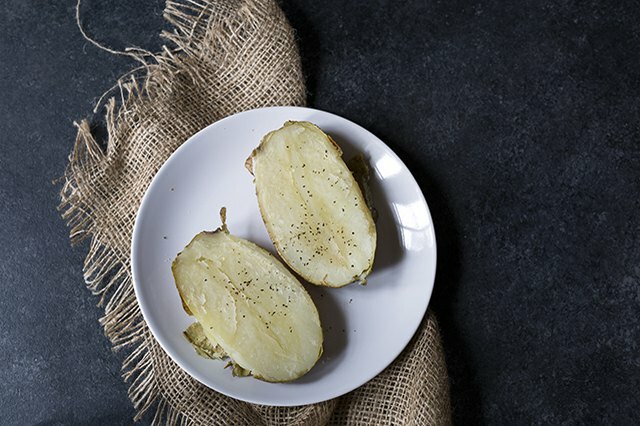 In one hour, you can have a perfect baked potato that can be enjoyed on it's own, alongside your favorite meal, or loaded up with delicious toppings such as sour cream and chives for a fun appetizer. Scrub the potatoes under cold water. If there are any eyes or sprouts, use a small spoon or paring knife to carefully remove them. 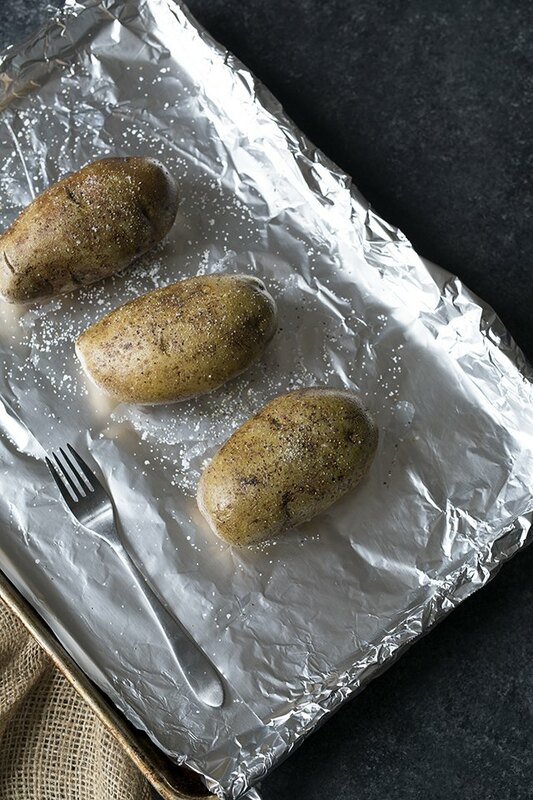 Preheat the oven to 400 degrees F and line a baking sheet with aluminum foil. Rub a small amount of extra virgin olive oil all over the potatoes, just enough to leave a thin coating. Sprinkle the potatoes with salt and pepper. 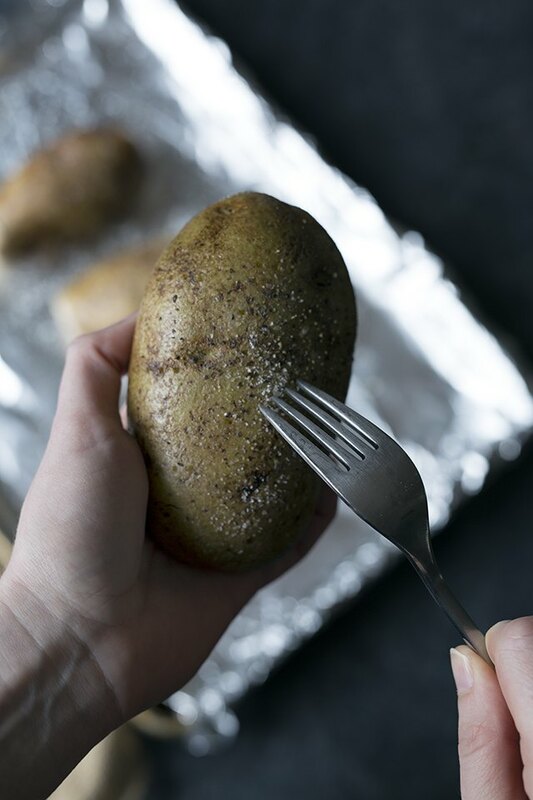 Gently press the tines of a fork into each potato numerous times on all sides. The idea isn't to pierce the flesh but the skin. This will allow steam to escape during the cooking process, and will prevent the skin from splitting. 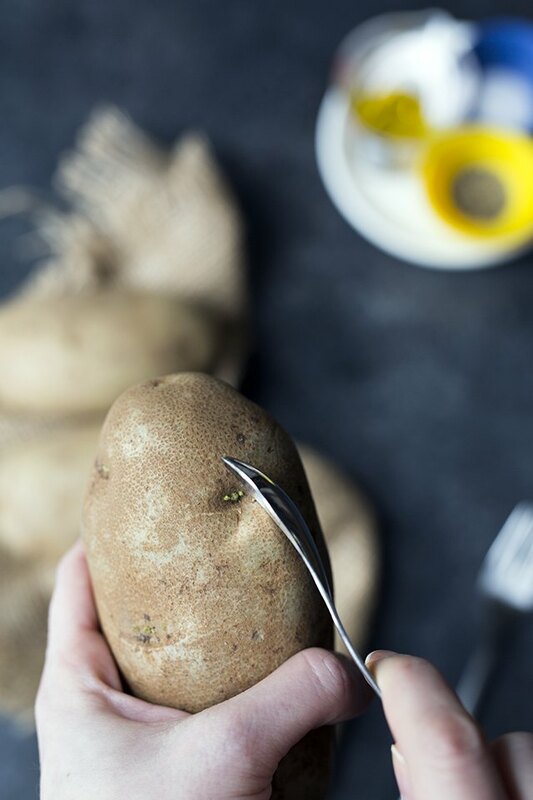 Bake for 55 to 60 minutes, using tongs to carefully flip the potatoes 2 to 3 times during the cooking process. Remove from the oven, slice in half, and serve. 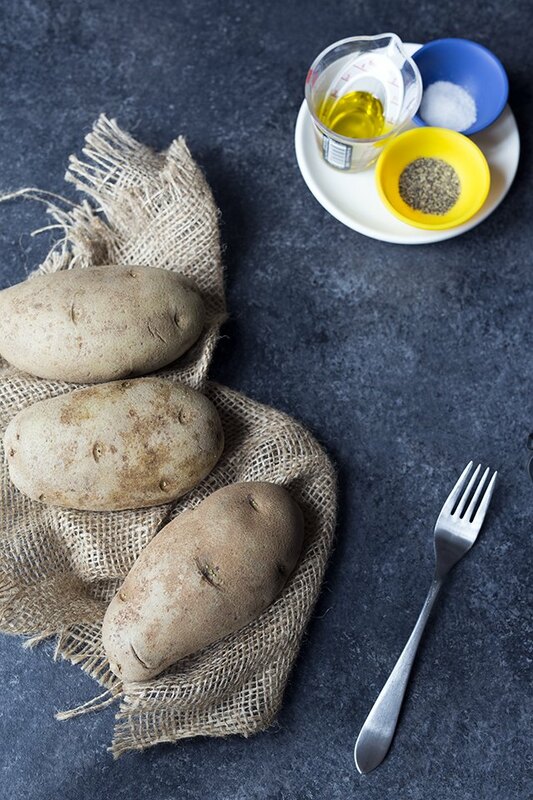 Baked potatoes are wonderful served on their own with a bit of butter, salt and pepper. 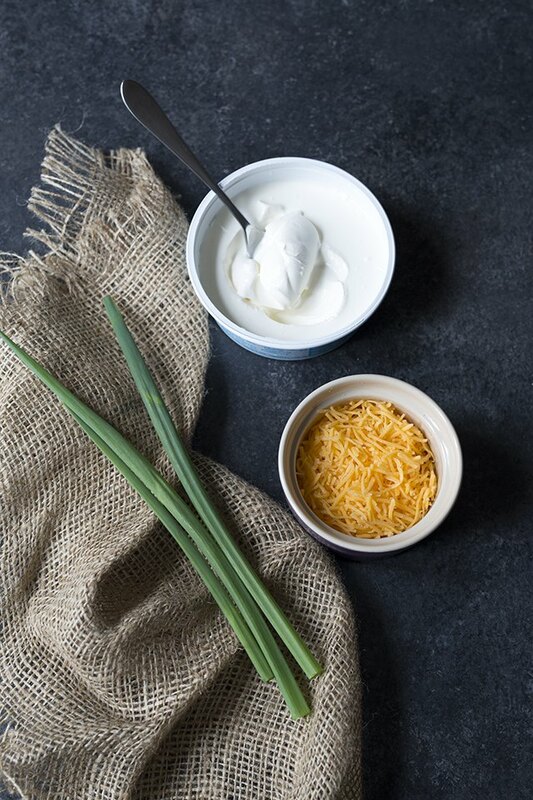 But you can also get creative with toppings such as sour cream, cheddar cheese, green onions, or chives.